Zombies to invade East Village Halloween Adventure! The day is almost upon us! This Sunday, October 25th Zombies will once again take on Union Square and the Lower East Side! Our main base will be the Beauty Bar NYC (where we’ll begin and end) and we’ll be crawling to Union Square, Whole Foods (for a canned food drive), Halloween Adventure, Astor Place, The Continental and more! We’re going to be joined by a lot of press, including CBS Sunday Morning & Japanese network Nippon TV and more so we’re asking everyone to come already dressed as their Sunday Zombie Best! We’ll have very limited zombie makeup stations too for those who need to be zombified, but supplies are limited! Here are all the details…and don’t forget to join us in the Halloween Parade on the 31st! Sunday, October 25th – NYC Zombie Crawl 2009 – Starts at 5pm! This is the official 2009 NYC Zombie Crawl Event for Halloween! Starting at Beauty Bar - 231 E 14th St - New York, NY 10003 (Btwn 2nd and 3rd Ave) - from 5-6:30pm for the pre-game, zombies will then crawl around the Lower East Side to several bars then come back to the Beauty Bar for an open Domaine de Canton bar from 10-11pm and the Zombie Beauty Pageant! Since this event is taking place at bars, everyone must be 21+ for this event! Please come as a member of the undead, we will have very limited makeup stations at this crawl. You are invited to bring your own makeup and help zombify yourself and others if you'd like. Open Domaine de Canton Bar 10-11p! 10pm – 21 + - Rated X Undead Halloween Party at Don Hills with Michael T and Theo! 6:30pm - NYC Zombie Crawl in the Halloween Parade – ALL AGES - We’re teaming with PopCap Games, the creators of the hit video game ‘Plants vs Zombies’ to assemble a throng of plants and zombies to march in the 36th annual NYC Halloween Parade! There will be PvZ give aways and anyone who comes as a plant or zombie will be invited to join in the parade themselves! Halloween revelers who join the PvZ contingent will be eligible for the costume contest which will occur immediately following the parade. PopCap will be digging up some great prizes for best plant and best zombie costumes based on the game! The official meet-up spot for Plants and Zombies in the Parade is on Dominick St. between 6th Ave and Varick St. between 6 and 6:30 pm on the 31st. 10pm - Rated X Undead Halloween X-travaganza! - After the parade is through, everyone is invited to Don Hills for the official afterparty with the Rated X Undead Halloween Party hosted by Michael T, Theo and Zombie Ringleader Doug Sakmann! Anyone in costume will receive an extremely reduced rate of only $5 before Midnight! Details to be announced! Don Hill’s - 511 Greenwich St. at Spring St. NYC – 21 + - $5 before Midnight! AND DON’T FORGET THE OTHER ZOMBIE EVENTS ON FRIDAY in PHILLY and SATURDAY in NYC! This isnt your regular costume party! We suggest that what ever you wear is COVERED in fake BLOOD. No, dont come with real blood you disgusting SICKO! Tip: Wearing all white ensures you’ll look the BLOODIEST. Saturday, October 24th – Two Zombie Events! Time TBA – Manhattan - Zombiecon 2009 – Sign up at www.zombiecon.com for all the details! Details will only be announced to those who sign up on the Zombiecon website on the day of the event! You may have noticed that something hideous is happening--a plague has enveloped the globe, striking the young, rich, beautiful and famous with rotting flesh and oozing sores...celebrities are dying all around us and rising from the grave to take their revenge and devour us as we devoured them. Putrid Patrick Swazye, fetid Farrah Fawcett, mephitic Michael Jackson and more are ready for their last close up as they feast on ripe human brains. More to come...start working on your undead celebrity persona (from ANY era!) and get ready for braaaaaains! Thrill The World Is An Annual World-Wide Simultaneous Dance Of "Thriller" For World Records And Charity. A Global Tribute to Michael Jackson! Thrill The World NYC will be held on Saturday October 24th 2009 at 8:30pm in Astoria Park, Queens. Go to www.thrilltheworldnyc.com to sign up to be a part of this historic world wide event, there are FREE classes teaching Michael Jackson’s Thriller all month all over the city leading up to the big dance on the 24th!! Thrill the World NYC is currently raising money for its event as well as for Vh1 Save the Music. See the website and register for more details. Where will You Party on Halloween Night? Looking for a place to party on Halloween night? Halloween 2009 is just around the corner, and you'd better believe that the bars will be packed! This year, the holiday falls on a Saturday night. No one has to get up for work in the morning, so they'll all be going out. Why deal with the hassle of waiting in line when you can secure a ticket to an awesome event? Check out Joonbug's Halloween NYC list of events, promotions and ticket deals. Joonbug's Halloween guide says: It's that time of year again and we have everything you need to know about Halloween night and the weeks building up to it. Halloween parties NYC at Joonbug.com will give you the inside scoops on all things Halloween. With information on Halloween parties, restaurants, clubs, nightclubs, bars, lounges, costume shops, Halloween tickets and promotions, discounts and blogs; this Halloween 2009 events guide truly is the ultimate and only guide to the best Halloween night of your life. 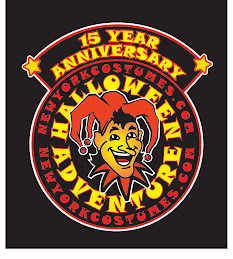 Also check out HalloweenNYC.com. They're featuring events at hot nightlife spots like Amalia, China Grill, Aspen Grill, D'or and more! They even have hour long open bars. Check out all of their events and more HERE.